Tecnored process was developed by ‘Tecnored Desenvolvimento Tecnológico S.A.’ of Brazil and is based upon a low pressure moving bed reduction furnace which reduces cold bonded, carbon bearing, self-fluxing, and self-reducing pellets. Reduction is carried out in a short height shaft furnace of distinct design at typical reduction temperatures. The process produces hot metal (liquid iron). Tecnored technology has been conceived and developed to be a ‘coke-less’ ironmaking process, thus avoiding the investment and operation of environmentally harmful coke ovens besides significantly reducing green-house gas emissions in the production of hot metal. Tecnored process uses a combination of hot and cold blast and requires no additional oxygen. It eliminates the need for coke plants, sinter plants, and tonnage oxygen plants. Hence, the process has much lower operating and investment costs than those of traditional ironmaking routes. Tecnored process is flexible with regard to the type of iron bearing and carbon bearing raw materials which it can process. The ability of the process to smelt either pellets or briquettes, or even mixed charges of both, provides means of using a wide range of alternative feed materials. The process has got good productivity and high energy efficiency. Tecnored process is also being claimed to be suitable for producing ferro alloys such as ferro manganese. The history of the development of the Tecnored process comprises different phases with different goals, testing a wide range of raw materials and using distinct sizes and concepts of the reactor. During the period 1979 to 1985, development activities were carried out regarding the use of pyrite cinder containing self-reducing pellets as metallic burden in cupola furnaces. This concept of self-reduction was adapted to develop the new process. In 1985 the concept of the Tecnored furnace has been formulated including the side feeders for the solid fuel and the post combustion in the upper shaft as the two main features of the technology. During 1985 assemblage of the first prototype of the Tecnored furnace started in the city of Joinvile situated in the Santa Catarina state of Brazil to experience reduction process at the pilot plant scale. During the period 1985 to 1990, process development took place in a small circular furnace of 400 mm diameter, aiming at to demonstrate the feasibility of the concept of the new furnace besides to establish the first operational and geometrical parameters. During this development phase, good continuous feeding and tapping (up to 24 hr continuous heats) were achieved which corroborated the adequacy of the concept of the Tecnored furnace. Although the results achieved in this phase were expressive, more than the empirical method of development a better fundamental understanding of the process was required to decide on the next steps on the development. Therefore, for the design and construction of larger pilot furnace, a very comprehensive mathematical modeling of the behaviour of a self-reducing pellet in the Tecnored furnace was built. During the period 1990 to 1993, process development was carried out in a larger circular furnace of 600 mm diameter. This was done with the aims at to achieve longer campaigns, higher operational stability, geometrical and operational adjustment based on the mathematical modeling and higher yield of the post combustion. The results achieved during this phase was longer periods of smooth operational stability, control and maintenance of the charge feeding rate, control of slag and hot metal tapping procedure, improvements on the fluid-dynamics of the process, and close assessment of the thermal and gaseous profile inside the furnace. However, the 600 mm furnace approached its limit to assist the experimental development of the technology and therefore, after 3 years of experiments, it was decided to continue the development process in a new larger pilot furnace with 1000 mm diameter. Also, the mathematical modeling of the process in this period indicated that to achieve higher production in addition to the larger furnace, for the keeping of a suitable raceway and flame engineering on the Tecnored furnace, the geometry of the furnace is to be changed from circular to rectangular cross-section. During the period 1994 to 1995, process developments were carried out in 1000 mm diameter circular furnace. This was done with the aims to confirm the geometrical and operational parameters in a large furnace, besides to check the growing limitation of circular furnaces as indicated by the modeling. The results achieved during the operation of larger circular pilot furnace confirmed high operational stability, good furnace control, long campaign duration, good hot metal and slag quality etc. Also, the 1000 mm diameter pilot furnace confirmed the prediction of the mathematical modeling that the furnace size could not increase while being circular, paving the way for the creation of the modular concept, i.e. having a rectangular furnace it would be possible to increase the production by adding extra modules while keeping a fix cross section. This led the decision to build a full size modular slice of the Tecnored furnace of rectangular cross-section. During 1996, testing of the new furnace concept was carried out using a small pilot furnace with one tuyere only. The operational results achieved corroborated the adequacy of the new concept for ironmaking based on the use of self-reducing agglomerates. Based on the results, a full size modular slice of the Tecnored pilot furnace was constructed. During the period 1997 to 2000, risk abatement procedure and tests assisted design of the industrial furnace using a full size slice were carried out. Based on this new rectangular design, the modularity of the furnace could be exploited by the successful construction and testing of the preliminary cellular furnace. In this phase, continuous test runs in week long campaigns in the full scale modular slice have been carried out in over 100 separate tests, adding up to 1000 hours of operation. During the course of the development over these 100 test runs, in excess of 1000 tons of high quality hot metal was produced. The quality of the hot metal was similar to the hot metal from blast furnace. The successful completion of the pilot plant stage of the development of the Tecnored process has paved the way for the construction of industrial scale facilities for both virgin iron units’ plants, as well as plants for recycling mining and steel mill wastes. During the operation the pilot plant Tecnored furnace proved to be a novel and very beneficial method to develop this metallurgical process and the fundamental furnace design parameters required for the first operating facility were determined during the course of the pilot plant tests. The tests helped in the development of a project for construction of an industrial demonstration plant (IDP), with capacity for 75,000 tons per year was carried out. The IDP is located Pindamonhangaba municipality in São Paulo state of Brazil. During 2008-2009, the construction of IDP was completed and operations licenses were obtained. By 2011, the modifications for peripheral devices and accessories of the Tecnored furnace were completed, the project for the raw material development started, and start-up of the Tecnored furnace began. During the year 2012, Tecnored furnace operation started as well as the feasibility studies for construction of a bigger plant of capacity 300,000 tons per year at Carajas, in the Para state of Brazil started. The Tecnored process is a new approach to ironmaking technology that uses cold bonded self-reducing agglomerates (pellets or briquettes), produced from iron ore fines or iron bearing residues, plus fines of pet coke, coal, charcoal, or carbon bearing residues. These materials, mixed with fluxing and binding agents, are agglomerated and cured on dryer, producing briquettes/pellets which have sufficient strength for the physical and metallurgical demands of the Tecnored process. The agglomerates produced are smelted in a shaft furnace of high efficiency and unique design which is known as the Tecnored furnace. Tecnored furnace, due to its low stack height uses low cost solid fuels, such as green petroleum coke, coal or semi cokes. 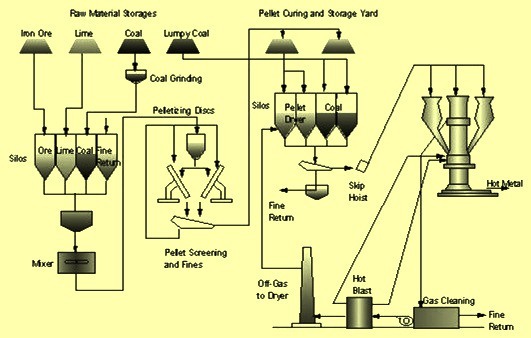 The main feature of this process is that it uses relatively low-cost materials such as fine iron ores or residual oxides and coal/charcoal fines (or petroleum coke) as the reductant/fuel. The Tecnored furnace is the heart of the process. The schematic flow sheet of the process is at Fig 1. The process consists of pelletizing iron ore fines with a size less than 140 mesh, coke fines with a size less than 200 mesh, and a flux such as hydrated lime of size less than 140 mesh using cement as the binder. The pellets are cured and dried at 200 deg C before they are fed to the top of the Tecnored furnace. The internal pressure of the furnace is maintained in the range of around 0.25 kg/sq cm to 0.37 kg/sq cm. The total residence time of the charge in the furnace is around 30 minutes to 40 minutes. Solid fuel of size ranging from 40 mm to 80 mm is fed in the furnace below the hot pellet area using side feeders. Hot blast air at around 1150 deg C is blown in through tuyeres located in the side of the furnace to provide combustion air for the coke. A small amount of furnace gas is allowed to flow through the side feeders to use for the solid fuel drying and preheating. Cold blast air is blown in at a higher point to promote post combustion of CO in the upper shaft. In case of use of solid fuel with high sulphur necessitates an elaborate cleaning system for the furnace gases in order to meet environmental regulations. The hot metal produced is tapped into a ladle on a ladle car, which can tilt the ladle for de-slagging. The liquid iron is desulphurized in the ladle, and slag raked into a slag pot. The furnace has three zones namely (i) upper shaft zone, (ii) melting zone, and (ii) lower shaft zone. In the upper shaft zone of the furnace solid fuel is charged in the upper shaft. Boudouard reaction (CO2 + C = 2 CO) on the fuel is prevented which saves energy. Post combustion in this zone of the furnace burns CO which provides energy for preheating and reduction of the charge. Also inside the pellets the following reactions take place at a very fast rate. In the melting zone, reoxidation is prevented because of the reducing atmosphere in the charge. The melting of the charge takes place under reducing atmosphere. In the lower shaft zone of the furnace, low grade solid fuel is charged. The low grade solid fuel can also include scrapped plastics and used tyres because of low stack height of the furnace. In this zone remaining reduction of residual iron oxides and slagging reactions of gangue materials and fuel ash takes place in the liquid state. Also, super heating of metal and slag droplets take place. These super-heated metal and slag droplets sink due to gravity to furnace hearth and accumulate there. The process uses two different inputs of carbon units namely (i) the reduct­ant, and (ii) the solid fuel, optimizing the flexibility of the process. The reducing agent is normally coal fines but practically fines of any type of carbon enriched material can be used. It is added in the mixture from which the self-reducing agglomerates (pellets or briquettes) are produced. The quantity of coal fines required is established by a C/F (carbon to ore fines) ratio, usually enough to achieve full reduction of the charge, by simply providing the needed heat for the process. In the self-reduction, the external CO does not play a significant role in the reduction process. The lumpy solid fuel is charged through side feeders (to avoid the endothermic solu­tion-loss Boudouard reaction in the upper shaft) and is responsible to form the char bed and to provide most of the energy demanded by the process. This energy is formed by the primary blast (C + O2 = CO2) and by the secondary blast, where the upstream CO, generated by the gasi­fication of the solid fuel at the hearth, is burned (CO + ½O2 = CO2). 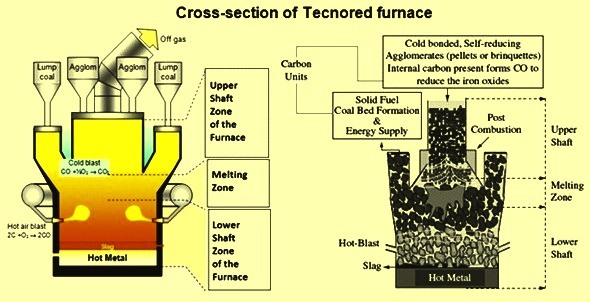 Fig 2 shows a schematic cross section of the Tecnored furnace, where these two important features are highlighted. Since the ultimate function of the two carbon units used in the Tecnored process is different, there are distinct specifications of these two carbon units, not only in terms of chemical composition, but also with respect to size range. The solid fuel portion requires lumpy material, typically 40 mm to 80 mm in size which is capable of handling the physical and thermal needs required from the solid fuels in the Tecnored process. The lumpy fuel used in the Tecnored furnace is required to create the permeability in the hearth of the furnace for an even flow of the liquid and gaseous phase. 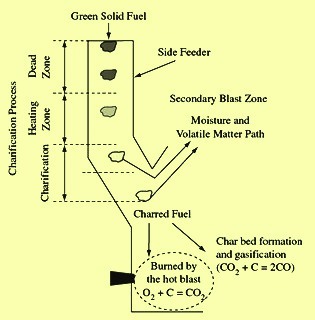 Hence, the solid fuel selected to be used in the process, at the end-point of the side feeder, after the charifica­tion process (Fig 3), must provide a lumpy char, with an skeleton strong enough to support the load of the charge, besides a good reactivity to promote a suitable RAFT (raceway adiabatic flame temperature) and flame geometry. It must also able to create the desired CO / CO2 ratio at the top of the char bed. However, it is rather important to mention that the mechanical load imposed to the char bed is extremely small, due to the high volumetric productivity of the furnace, resulting in a furnace with a lower shaft height. This feature of the process is one of the main reasons which explain the ability of the furnace to function without the use of coke and allow the use of low-grade solid fuels. The specific consumptions of fuels per ton of hot metal are 250 kg coal and 310 kg of solid fuel to produce hot metal with 3 % to 4.5 % of carbon and 0.2 % to 1.0 % of Si. Hot metal temperature is normally in the range of 1380 deg C to 1430 deg C.